Created by Danielle Fleet & Yvette Gilmartin, BA in Fashion, Kingston University London. 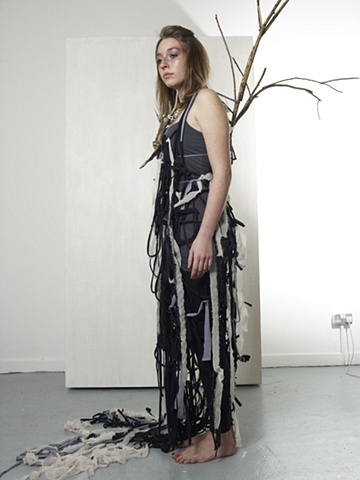 Her materials are black jersey teased, Red Deer antlers, frayed and knotted, branches of London Plane and Sycamore to become antlers exposed to weathering, the elements, being close to nature. She exists in a space of social memory where hope and loss are linked. State Police Superintendent Steven Flaherty delivered the news with what he described as a heavy heart. When her body was found, he said he first thought it was a deer, until he got closer and realized they were human remains.